If the St. George heat is a little too much for you, try relocating to the slightly cooler Hurricane Valley. Hurricane Valley, pronounced “Her-ah-kun” by the locals, received its name in the early 1860s when a whirlwind blew off the top of founder Erastus Snow’s buggy. He exclaimed, “Well, that was a Hurricane. We’ll name this the Hurricane Hill.” This valley was originally a farming community, rich with orchards, vineyards, and fields of alfalfa, grain, and sugar beets, earning its nickname “The Fruit Basket of Southern Utah.” Now, this area has become a landing spot for many people looking to escape the cold winters up north, or get a bit of a break from the hot summers down south with a boasting population of nearly 11,000 residents, and the numbers are still climbing. If you love being outdoors, Hurricane Valley is within close proximity to several national parks including Zion’s National Park, Grand Canyon National Park, and Lake Powell. 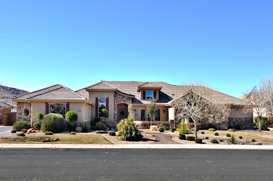 Fisherman, boaters, and water skiers will enjoy being minutes away from Quail Creek and Sand Hollow reservoirs. If you enjoy the “hometown feel” you won’t want to miss Hurricane’s annual Peach Days each Labor Day Weekend which celebrates the area’s fruit growing heritage. The area also features several southern Utah historical landmarks that any history admirer would appreciate. Don’t miss out on finding a great home in wonderful Hurricane Valley today. Please take the opportunity to search homes in the area, and contact us for more information on the area or on a home you would like to learn more about. We look forward to hearing from you. © 2019 Washington County Board of Realtors MLS. IDX information is provided exclusively for consumers' personal, non-commercial use and may not be used for any purpose other than to identify prospective properties consumers may be interested in purchasing. Information is deemed reliable but is not guaranteed accurate by the MLS or The Real Estate Collective. Data last updated: 2019-04-22T12:48:39.39.